Some reviewers loved its grippy outsole. Many wearers mentioned that the Topo Athletic Runventure 2 was one of the most stable shoes they have ever worn. Some of the purchasers agreed that the shoe has a roomy toe box. A good number of wearers commented that the fit was perfect. The Topo Athletic Runventure 2 was comfortable, according to many runners. Several testers loved its lightweight structure. Many consumers noted that the shoe has an excellent cushioning. The majority of the buyers noted that the shoe provided enough underfoot protection. Based on some reviews, the Topo Athletic Runventure 2 was breathable. A handful of testers said that the shoe was great for running and everyday activities. Some users commented that the shoe has a stiff midsole. Based on observations, the Topo Athletic Runventure 2 was not a fast running shoe. The Topo Athletic Runventure 2 has made many runners satisfied because of its excellent cushioning and impressive fit. Aside from the lightweight structure, the shoe also offers a right amount of stability, comfort, and breathability. While others have issues on the stiff midsole, others still appreciated the shoe because of its performance. Overall, the Topo Athletic Runventure 2 is a good investment for runners who are looking for a lightweight, protective and versatile running shoe. Topo Runventure 2: What sets it apart from the rest? The Topo Runventure 2 is a natural style lightweight trail running shoe that excels as a daily trainer while being capable of light speed work and longer distance trail racing. 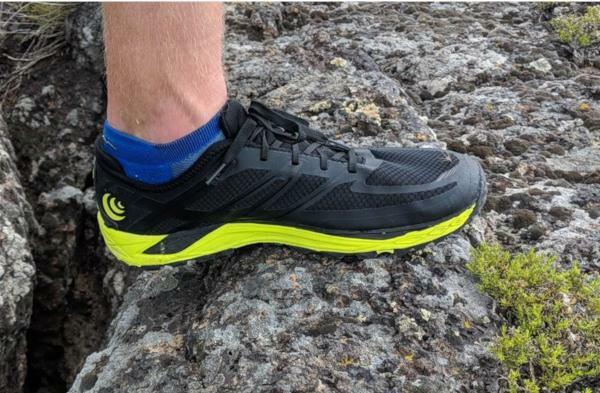 What makes the Runventure stand out from the standard trail running shoe? The Runventure is a zero drop shoe. This means that there is no difference between the stack height of the heel cushion and the stack height of the forefoot cushion. Although the Runventure has significant cushioning, the zero drop platform gives the shoe a very natural, almost barefoot ride. As with any zero drop shoe, the Runventure is targeted at forefoot strikers; zero drop shoes feel very nimble while forefoot striking but slow, clumsy, harsh feeling for heel strikers. The Runventure has a slightly wide fit in the heel and midfoot and a very wide fit in the toe box. The wide toe box allows for your toes to splay upon impact: the natural way of running. The wide toe box also allows you to keep your big toe straight as you power off. This is a much more powerful stance than the standard, where the big toe that is forced to curve inwards by a tapered toe box. The wide toe box adds to the barefoot feeling of this shoe since you naturally splay your toes when running. The wide toe box also causes your feet to slide forward in the shoe during steep descents, which is the biggest problem with this shoe. Topo Athletic needs to make a more adaptable lacing system, similar to Nike's Flywire or Saucony's Isofit in order to fix this problem. The Runventure weighs only 9.2 ounces. This is very lightweight, especially considering all of the protective features this shoe offers. The Runventure certainly doesn't feel like a barefoot shoe when it comes to weight, but it doesn’t feel heavy either. The Runventure has a unique heel collar made of a thin, stretchy synthetic material. The heel collar material feels similar to neoprene. This shoe has one of the most comfortable heel collars I have ever run in because of the way that it molds to the shape of my foot. Additionally, the heel cup performs just as well when wet. What makes the Runventure so special is that it has the ride of a barefoot shoe along with the protection of a tank. The Runventure features a very thick rubber outsole, aggressive lugs, a rockplate, a thick, firm midsole, a wide platform, a toe bumper, a mud guard and a protective upper. All these features put together make the Runventures bodyguards for your feet. While wearing the Runventures you are completely protected from anything the trail throws at you. The only exception is with steep descents: the fit is a little too wide, so your feet will slide forward in the shoe. All these protective features make the Runventure a little stiffer than I would like from a natural style running shoe. In addition to being extremely protective, the Runventure is a very durable shoe. All components of this shoe are built to last. The outsole lugs are made of durable carbon rubber, the midsole is dense enough such that it will collapse very slowly, and the upper is non-abrasive, so it will neither cause blisters nor will it tear. This shoe will definetsy last a full 500 miles. The Topo Runventure is a slightly more built up version of the Superior. The Runventure has more cushioning and more protective features, whereas the Superior is more nimble and fast. One key difference is the Superior has a superior fit- your foot won’t slide forward during descents. The Runventure weighs half an ounce more than the superior. The Trailroc 285 is the normal shoe version of the Runventure. The two shoes are lightweight, low profile trail running shoes that are both very durable and protective. The difference is the platform and the fit. The Trailroc has the standard narrow toe box and 8mm drop, whilst the Runventure has a wide toe box and is zero drop. These two shoes are very similar, the only difference is the upper. The Hydroventure has a waterproof upper. The upper is less breathable and less comfortable, but it keeps out debris (and water) far better than the Runventure. Unlike most other shoes, I don’t mind running in the Runventures when they are wet, so I like the runventrues more than the Hydroventures, but if you don’t like wet feet, try out the Hydroventures! I recommend this shoe to any efficient forefoot striker looking for a new all-round trail running shoe with a natural ride and a ton of protection. The Runventure can handle all daily training, light speedwork, and longer races. This shoe is not too comfortable on roads; if you run a long way on roads to access trails, you may want to explore other shoes. Try the Runventure on before buying it, as it does have a wide fit. Topo has done a fantastic job with Runventure. If Topo keeps producing such high-quality shoes that are so fun to wear, they are sure to become one of the big name shoe brands. I took off points mostly because my feet slipped forward on a steeper descent, no matter how much I cranked down on the laces. I also wish this shoe were a little bit more flexible to enhance the barefoot feeling. Once Topo fixes these issues it will be one of the strongest trail running shoes on the market. The Runventure 2 by Topo represents how simple yet brilliant a trail shoe can be. There are areas that could be perfected – and I seriously pray that Topo goes with better laces for all of their shoes, but the truth of it is that the Runventure 2 has great tread, grips very well, and easily can go the distance in terms of how long they will last. Starting from the top down – just to get my main complaint out of the way. The RV2’s laces are the same that Topo seems to enjoy using for other models, which is to say they are the standard flat laces that were also on the Magnifly 2 that I tested. I hated them on that shoe and I hated them on this shoe as well. They come untied easily which means you need to double knot – I don’t know why that annoys me so much but it does. For the last 15 miles prior to writing this, I switched to caterpillar laces that have a slight give and area easily adjusted even when in use. Do that and you will never have this complaint. The laces also have a lace lock hole but I would recommend avoiding this for the RV2. This is because the section that goes from the front of the foot to the heel is somewhat stiffer material and using that back hole caused the area to bulge a bit which had me picking small pebbles and what not out of my shoe anytime I hit the trail. Just use the front one and this problem seems to go away completely. To be fair, I do have small ankles and thin feet so this may not be an issue for the average runner. Heel yeah! The heel area of the shoe has an extra piece of fabric at the top that not only keeps it from rubbing and causing blisters but also helps prevent gravel or dirt from getting in through that area. Topo also added gaiter hooks - which was a pretty cool move on their part. I did not know what gaiters were and if you do not either, they are a piece of fabric (spandex maybe?) that attach to the shoe and around the ankle area to keep all debris out. If you’re going to spend some time on the trail then they may be worth a shot – and Topo is equipped to support! The cushioning at the back of the heel area also felt nice in that I never noticed a single problem even after 10 miles on nothing but trails. The upper mesh area of the shoes breathes extremely well and felt very comfortable. The roomy toe box uses a mold that was previously restricted to shoes like Birkenstocks but trust me, you’ll love the toe room of the box as it allows the toes to splay out more naturally rather than being restricted as with many shoes. The RV2 is quite durable with a thin layer of EVA foam between the foot and the tread. The tread itself is tough with just enough flex to allow your foot to move naturally while not being so soft any and every bump was felt. However, this does cause one other issue – hard sections such as creek beds, rocky areas, and pavement will quickly cause your feet to take a pounding because there is not enough cushioning to protect from that. The end of my 10-mile trail consisted of a rocky area than a 1-mile pavement jog back to the parking area. My form was probably a bit sloppy and by the end, my feet were actually feeling the pain. This is a minor complaint and nothing that would stand in the way of purchasing these zero drop shoes (more on that in a moment). The tread has knobs (think of a mud tire) that provide excellent grip whether going uphill or down. You can appreciate a good grip because sliding was not an issue and even cornering on downhill slopes was easy as it was on a flat surface. Also, these knobs are not so big that they hurt or are even noticed and they do not wear down so quickly that the shoes won’t last. The zero drop is one of the big pulls to the Runventure 2 and if you are looking to stay more forward on your feet in regards to landing then zero drop is the way to go. It almost forces you to run midfoot or further up because your heels will quickly let you know they do not want the brunt of the landing. This also helps keep pressure off of the spine and can be easier on the joints (according to some research). Personally, I like it because I feel more natural that way and also it is a nice way to work the calves a bit! I thoroughly enjoy using Topo’s Runventure 2 shoes for trail runs but I definitely want to keep off the pavement with them. If I think I’ll be hitting sections of pavement or many rocky areas then I would go for a different pair in the closet such as my La Sportiva Wildcats. This is just my personal opinion and to prove that, a friend of mine has the same pair but has already put over 400 miles on them and uses them exclusively unless he is specifically road running. They have great tread, breathe well, and are gaiter ready. For a zero drop shoe with a wide toe box, one would be hard pressed to find a better pair… just change the dang laces! I first heard about Topo Athletic when the founder was on a running podcast. I agreed with his general philosophy about running shoes and decided to try out a pair of the trail shoes since my old Hoka Challenger 2 ATR were getting pretty up in their miles. In all three of these uses, the Topo’s Runventure 2 has excelled in my past 6 months of use. Typically, I’m wary of new brands or the first iteration of a product; however, these shoes have surprised me with their build quality and overall feel. The first real miles I put on these shoes when I was at a work trip out in Idaho Falls, Idaho. There is a nice little-paved trail around a portion of the river that I ran almost every day that week, and I did some trail running as well as a few miles on a gravel road. The trail running was a trial by fire as well, as the ‘running’ was over an old lava field, which was essentially all extremely rough and uneven black rock that would have torn to pieces most road shoes. The Runventure 2 emerged from that trail essentially unscathed. Since then, I’ve put on about 100 miles running and one very wet 30-mile backpacking trip. About 20 miles of that 100 were on either snowy or icy trails. They are still holding up and looking solid other than some well-deserved dirt in the lugs. Topo has found a beautiful compromise between a roomy toe-box and a good looking shoe. The materials feel high quality, and the rock shield in the midsole is solid while still allowing some feel of the trail. Topo also did the laces right. Especially for a "roomier" trail shoe, the laces should be long enough to allow for different lacing styles, but short enough that they don’t get in the way, and these laces do just that. Also worth mentioning is the integrated gator that Topo makes. I don’t own them, but I’ve heard good things about it and like how seamless the integration system is. Definitely, a nice feature for backpacking and long trail runs if you’re into that sort of thing! The shoes are snug but roomy and surprisingly sturdy and responsive on the trail. They feel great on my feet, however, the cushioning compared to the Altra Escalante and the Brooks Pureflow 7 that I typically run in is noticeably stiffer and less substantial. That being said, they still feel comfortable, and my feet were not fatigued after 9 miles on concrete with them. Given that these are primarily trail shoes, I think they have ample cushioning for the trail, but there is possibly some room for improvement here. The sole and lugs on the Runventure 2 are well designed - not too big, but big and sticky enough to give me confidence on rock, dirt, mud, or even a little snow and ice. I wouldn’t change anything about the sole pattern. The outer material is quite thin with minimal padding, but that makes for a very breathable shoe. They dry quickly and keep my feet from pooling with sweat during the hot months. Their low weight and responsive sole make them quite fast as well. On one of my first runs in Idaho Falls, I set a PR for a 10k according to strava (I don’t race the 10k distance) without setting out to do so, but that could have also been due to the flat path I took as compared to my hilly home in Pittsburgh. Regardless, these are quick shoes that I would happily lace up for a trail race. I am blown away with their durability. Trail shoes are supposed to be tough, but these suckers were subjected to 1.5 hours of hopping around in an old lava field and came out practically unscathed. I hope to get at least 300 more miles out of these shoes before retiring them to yard work. It’s a great shoe, and I will be back to try out other Topo Athletic shoes without a doubt! Would I buy again? Definitely. Would I recommend to a friend? Yes, and I do so constantly! I am excited about the Runventure 2 as a solid addition to my trail running gear. While I remain concerned about the traction on steep climbs, I am thrilled with how they handle and wear in every other condition. I would give the Topo Runventure 2 a solid A-. The Rock Protection Plate is used in the Topo Athletic Runventure 2. It aims to protect the platform against the hazardous nature of the trails. With the use of the Abrasion Resistant Mesh, added breathability is offered. Because of this material, users will be able to achieve a more comfortable running experience. This material is focused on providing maximum durability. It protects the platform from the hazardous nature of the trails. This Topo Athletic shoe features the full-length EVA midsole. The purpose of this material is to deliver the right amount of protection and cushioning that the runners need in their activities. The Topo Athletic Runventure 2 runs true to size, and it offers a breathable and comfortable fit to medium-footed runners. The shoe is available in standard medium B and D widths for the women’s and the men’s respectively. The multi-directional lugs are integrated into the Topo Athletic Runventure 2. These lugs aim to provide the right amount of traction that the runner needed over a wide variety of surfaces. Running the length of the shoe is the Rubber Outsole. The material is essential in increasing the durability of the platform. It also provides added traction. Utilized in the shoe is the Rock Protection Plate. The goal of which is to provide additional protection against the hazardous materials that can be found on the trails. With the utilization of the full-length EVA midsole, increased cushioning and protection are offered. A Cushioning is a soft material that is vital in absorbing shock during heel-to-toe transitions. Breathability is encouraged by the Abrasion Resistant Mesh. Apart from its breathability, the material keeps the shoe free from debris during the running sessions. Its primary goal is to provide additional durability to the platform for it to last for a longer period of time. The Printed Upper Pattern is integrated into the Topo Athletic Runventure 2. The primary focus of this patter is to deliver a snugger midfoot lockdown. As a result, the runner will be able to experience a more anatomical fit. The uses the Anatomical Toe Box. This material is shaped as an extra wide toe box. As a result, the toes can spread out naturally without compromising comfort. To make the structure of the shoe less rigid, the Elastane heel is utilized in the Topo Athletic Runventure 2. As a result, a more natural feel is experienced by the runner. Through the molded openings in the heel area, the Gaiter compatibility is integrated. This technology is significant in allowing the gaiter to be hooked in place.